This article has been updated to reflect the most recent Giving Tuesday statistics and best practices. Charitable giving in the United States was $358.38 billion in 2014, but has risen to $390 billion in 2016. The largest portion of those donations came from individual donors who either contributed personally or through their company’s giving programs. This brings us to a very important holiday in charitable giving, Giving Tuesday, which is on November 28, 2017 this year. 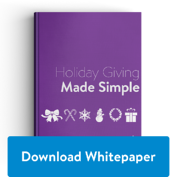 See how you can give more this holiday season by downloading our holiday giving whitepaper! If your company already participates in the #GivingTuesday campaign, awesome! You’re well on your way to helping charities, your community and building employee engagement. If your company has not participated, we encourage you to bring attention to this special day of giving. Whether you’ve participated before or not, take a look at our latest insight into making Giving Tuesday a shining success! Visit the #GivingTuesday official website to keep track of the countdown leading up to the big day and see how you can get involved outside your organization, too! #GivingTuesday is Nov 28 this year. Is your company prepared? Use these updated best practices: Tweet This! 84% of survey participants revealed they’re more likely to donate if a match was offered. Companies like State Street Corporation, Johnson & Johnson, Microsoft, and more, have done an exceptional job in displaying truly winning gift matching strategies. Get inspired by their strategies and see if you’re willing to spark one up your own this year! If you’re looking for another way to boost participation this year’s Giving Tuesday, try hosting a raffle! Ask local businesses to donate goods and services to your raffle event, then have your employees bid. Donate the money raised from the event on Giving Tuesday to your company’s charities of choice. Social media and mobile make it easy to reach a wider audience including your employees and their networks. Make it mobile by integrating a fundraising page that’s mobile optimized. Flexible configuration tools and a built-in notification system are must-haves so you can easily share a message from your CEO, alert targeted employees to events or activities, post photos and promote goals and milestones all from your smartphone. Brand your donation pages to increase donations. Branded charity pages receive 6 times the donations than generic pages, so it’s safe to say a company-branded donation platform can earn the same response. Include brand logos and colors, company photos and messages from your CEO to make your employees feel like an important part of the entire experience. Pro Tip: Keep the hype going beyond #GivingTuesday by promoting popular hashtags like #MyGivingStory to encourage others around you to share their personal stories and successes. 86% of corporations matched employee contributions to charities in 2013 and as a result consumer confidence and CEO expectations continue to improve annually. 91% of customers switch to brands that support good causes. 79% of employees prefer to work for socially responsible companies and think it’s important companies match their charitable giving. #GivingTuesday has only been around since 2012, and while it’s growing vastly in popularity, some people or organizations may not even know about it yet! Share your company’s Giving Tuesday success with blog posts, company newsletters, on social and even in any other consumer or stakeholder communications. This helps spread the news and may lead to an even larger impact next year! The power of technology can either make or break your giving campaign. Gone are the days of posting a flyer on the bulletin board, to get the attention of every employee, you need a cross-channel effort. Embrace technology to spread the word to your workforce. You’re more likely to catch their eyes with an interactive email, social media campaign or better yet a unified philanthropy platform that gives employees access to over 2.1 million charities. Companies who enabled employees to choose which charities they gave to increased participation rate by 79% and raised 73% more. Different generations will respond to your efforts differently and if your company covers more than one location, there might be geographical considerations to consider as well. Cover all your bases with communications that span from verbal meetings with execs to intranet announcements. Have a Great Giving Tuesday! Elevate employee participation through your Giving Tuesday campaign this year with a highly configurable and intuitive system that manages and promotes all of your employee giving programs to make this year the most impactful employee giving event yet.